Thirty Pima County youth will participate in a mock-trial exercise, followed by a graduation ceremony and reception on Friday, July 14, celebrating their employment as summer interns with the courts in Pima County. The public is invited to attend both events, which will showcase what the students have experienced during their seven-week employment and education program in the courts’ and justice system. This year’s graduation ceremony will mark the 25th anniversary of the Courts Are Us program. Members of the Pima County Board of Supervisors will present a proclamation to retired Judge Norman Fenton, founder of the Courts Are Us program, declaring July 14 as “Judge Norman Fenton Day.” The 10:30 a.m. celebration in the Board of Supervisors Hearing Room also will include remarks by the Presiding Judge of Pima County, the Honorable Kyle A. Bryson, Pima County Administrator Chuck Huckelberry, members of the Board of Supervisors, and a select number of former Courts Are Us students. Prior to graduation, the Honorable Danelle Liwski will preside over a (mock) jury trial in courtroom 805 of the Superior Court. 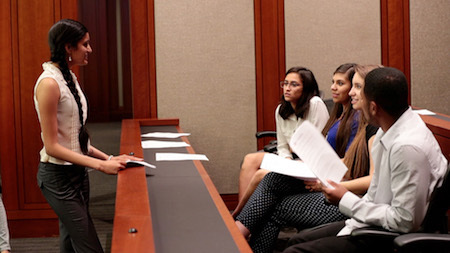 Students in the Courts Are Us program will take on roles as defense and prosecuting counsel, defendant and witnesses, bailiff, courtroom clerk, sketch artists and jurors in a court case designed to demonstrate a criminal trial proceeding in the Arizona judicial system. To date, more than 700 Pima County high school students have taken part in the Courts Are Us program, founded in 1992 in response to the Rodney King trial verdicts and ensuing Los Angeles riots. The goal of Courts Are Us, said Judge Fenton, is to share with students “the majesty, rights and freedoms” that come with exposure to the United States’ legal system. Student interns work a variety of jobs each summer in the Superior Court, Tucson City Court, Pima County Justice Court, and on occasion, the Pima County Attorney’s Office. Each student is assigned a supervisor in the courts' system who offers daily guidance, as well as a lawyer-mentor who provides direction and feedback on future goals. Courts Are Us is sponsored by the Superior Court in Pima County and Pima County Community Services, Employment and Training Department. Mock Trial: 8:30 a.m. Friday, July 14, Pima County Superior Court, Courtroom 805, 110 W. Congress. Graduation Ceremony: 10:30 a.m. Friday, July 14, Pima County Administration Building, 130 W. Congress, First Floor, Board of Supervisors Hearing Room. Top: Courts Are Us participants prepare for their mock trial competition. Bottom: Art Eckstrom (left), retired director of the county's Community Services, Employment and Training Department, with Courts Are Us founder Judge Norman Fenton.